This entry was posted in Writing and tagged Addison Moore, books, James Scott Bell, Jennie Nash, literature, Michelle DeRush, newbie writer, personable tone, price of admission, publishing process, Rachelle Gardner, self-publishing, short end of the stick, traditional publishing, writing process by Maurice F. Overholt. Bookmark the permalink. I also really love Rachelle Gardner’s blog, and I’d been looking at the book. I’m glad to see a review of it. Did this help you make any decisions publishing options or change any opinions you already had? I do not have a book in the works just yet, but her book gave me a real reason to consider why I would want to publish. 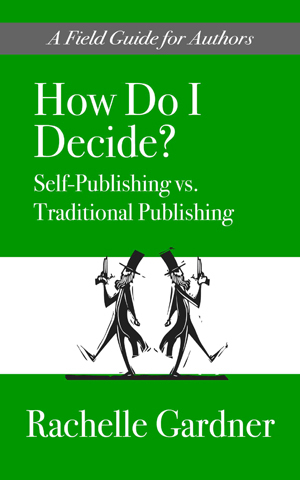 Ultimately that is the question that will make my decision: do I want to publish for personal benefit and a gift to my readers, or do I want to reach a many people as possible? That’s a fair question. I think I’ll check her book out and see for myself. Thanks for the information! I read Rachelle’s book and will be recommending it to several unpublished writers I know who are struggling with this question, It’s the best pros and cons presentation I’ve seen so far.